Are your oral history recordings sitting in an archive, not being used? Have you ever wanted to make use of the recordings for displays, a website, or presentations? Venue: University of South Australia (Magill Campus, H Building, first floor conference room – lift facilities available). A campus map is available here. There is free parking available off St Bernards Road, or opposite the campus, entrance off Edwards Street and on the old tennis courts. Download a flyer about the workshop here. Bookings essential. Please book online here. Computer with Audacity and PowerPoint software installed. 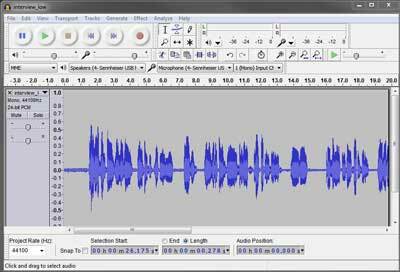 Audacity is free software for editing audio files. Download this instruction sheet on how to install Audacity on your computer. Audacity is available for Mac, Windows and Linux computers. Please let us know if you do not have PowerPoint software, and we will let you know of a free alternative. Headphones that plug in to your computer. Power cable for your computer. A mouse for your computer. Two people from the same organisation attending the workshop may choose to work together on one computer. Please let us know if you will have difficulty accessing a computer for the workshop. We do not want you to miss out! After we have received your online registration and payment, we will provide you with a link to download sample audio and image files to use at the workshop. Participants should be familiar with basic computer functions e.g. opening files, copying and pasting, and locating files on their computer. Download this instruction sheet on how to install the Audacity audio-editing software on your computer.